Do you share your blog posts on social media? Want to know how much traffic comes from those posts? By adding Google UTM (Urchin Tracking Module) parameters to the links you share, you can attribute traffic to page posts, group posts, and ads. UTMs let you differentiate one traffic source from another. You likely share the same link to your blog post on all of your social media platforms, but creating unique links with UTM parameters will help you discover more about your readers. These special links let you create identifiers, or parameters, within URLs so you can track referrals to blog posts, opt-ins, or landing pages you direct people to. With UTM links, you can send people from various places to the same landing page URL. You just have to tweak the URL with UTM parameters. UTM links let you track referrals from a variety of sources like your email newsletter, Facebook ads, Twitter, LinkedIn, and more! Note: Make sure you have Google Analytics installed on your website so you can track these URLs. To set up a UTM link, head over to Google URL Builder. 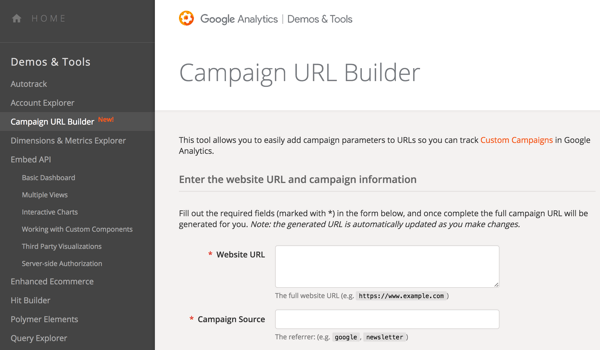 This tool will allow you to add those key identifiers to the URL so you can track your campaigns in Google Analytics. Suppose that you’ve written a blog post and you want to run a Facebook ad to promote it. You know you want to share a link to the blog post in your next email newsletter and on all of your social channels. Here’s how to add special parameters to your URL. The first step is to add the URL of your blog post to the Website URL box. Then in the Campaign Source field, enter the social media platform (Facebook) and the source (group post, page post, or ad) on which you plan to share this post. For instance, if you share the post in a Facebook group, on a Facebook page, and in a Facebook ad, you can use the Source field to create a unique URL for all three of those traffic sources. The rest of the fields are optional, but the Campaign Name field is important. When you ask Google to analyze these links, you want to use a unique name for each URL you build. This is how you’ll identify how much traffic you received from each link. Say you want to use a link in a page post, and then boost the page post to drive more traffic to your blog post. 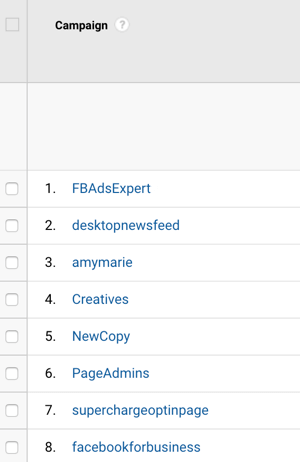 This example uses FBAdsExpert as the campaign name, based on the audience targeted with a Facebook ad. When you’re finished filling in the fields, you’ll have a unique URL you can share on your Facebook page. Now you can boost your post and ask Facebook to send more people to read your post. You can see that the blog URL has UTM parameters built right into it. Take special note of the last part of the link, where it says FBAdsExpert. This is what you’ll look for in Google Analytics. If you want to get granular using UTM links, you could create a new URL for each social media platform and give it a new name. For example, suppose you’ve created a new URL for LinkedIn. You named it LinkedInPost because you’ll use this link inside a post you’ll create on LinkedIn. Now that you’ve created a special UTM link to use, give Google a few days to gather data. Then head over to your Google Analytics and take a look at how well this link is doing. To access this data in Google Analytics, choose Acquisition > Campaigns > All Campaigns. You’ll see the campaign names for all of the special UTM links you’ve created for various ads. In this example, the top spot shows FBAdsExpert. When you create a special link, Google can analyze the traffic data so you know which source is working the best. Make sure you keep track of the entire UTM link you create. After you create a link, copy it to a Google Doc or a spreadsheet so you have all of your links in one place. A document like this will be helpful if you use UTM links regularly to share your content. Analyze your campaigns and combine them with Google Goals to track traffic sources to all of your content. Google Goals will take your UTM links even further by allowing you to track opt-ins after someone reads your blog post. Many marketers provide a content upgrade or lead magnet inside of their blog posts. When placing ads to this type of content, you’re generally looking to give away free value in the form of a worksheet or checklist in exchange for an email address. Combining UTM links and Google Goals allows you to assign a dollar value to each new subscriber. You can even designate a funnel, or path, that a subscriber takes from a traffic source. Using these two tools in combination will help you track how well your ads are doing. Using UTM links is an easy way to track referrals from different sources, whether paid or free. Focus your attention on the ads and social media platforms engaging with your content the most to create a seamless content strategy. What do you think? Have you used UTM links in your social media marketing? Were you surprised at which traffic source generated the most likes, shares, and comments? Please let us know in the comments. Access Your Data in Google AnalyticsDo you share your blog posts on social media?How to Use Google UTMs to Analyze Your Social Trafficsocial mediaWant to know how much traffic comes from those posts?What Is a UTM?